I live in the area around Dayton, Ohio with my husband, pets, and family who live close by. I am a self taught artist mostly. I took a few classes as a child but never really had any formal training. Raw feelings and emotions fuel my creativity. It is therapy for when I am distressed as well as when I am not. In a crazy, stressed world I struggle to keep my head clear and my thoughts straight. I learned that I am not suppose to please everyone and that I am normal. I hope that others enjoy my art and that they can find something in it that they can relate to. Artist reception at the Mac Worthington Galerie, 749 N. High St, Columbus, OH 6p-9p. 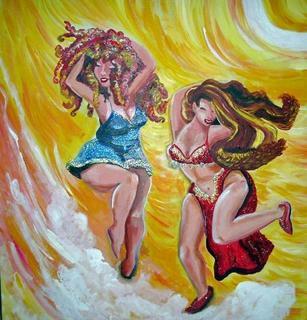 Please come and see "Dancing Ladies" by A.R. Sage!!! I've added my newest painting! And I've decided to call it "Fluffy Lady & Friend". Ok, it's now later in the day and I am finally finished with Fluffy Lady. I've called the painting "Best Friends". It's great because she is a "fluffy" middleaged lady sitting on her couch with her little dog and the look on their faces says it all-happy. interesting style love all the pieces. This is art that improves your mood. Very optimistic. I don't know how you could give that energy to your surfing and dancing women. I love the characters and colors you have painted, very nice!